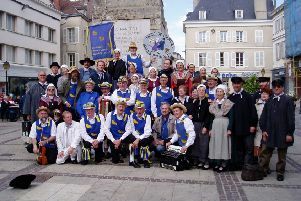 The Chichester Singers more than justified the decision of the Festival of Chichester 2015 organisers to give the choir a prestige position for their Cathedral concert. The singers were at their very best and totally at ease with the demanding works they performed. They beautifully portrayed the strong operatic influences in Puccini’s Messa Di Gloria which he had written at the age of 20 for his musical graduation. Surprisingly, this work had remained unperformed for 72 years despite its rapturous reception on its first performance. The stunning sound the choir produced was dramatic and inspiring and certainly pleased their modern audience. The youthful looks of tenor John Porter hid the confidence and maturity of his singing which added greatly to the overall effect. He was partnered by Thomas Humphreys (baritone) whose singing was well received. Under the masterly direction of Jonathan Willcocks, the Southern Pro Musica, the choir and soloists could not be faulted but it was Richard Barnes who truly excelled. In the second work, Te Deum by Hector Berlioz the organ contribution is pivotal to the composition. His contrition was stupendous filling the Cathedral with glorious sound using the acoustics of the building to their maximum. What distinguishes the Chichester Singers above all other local choirs is the fact that it consistently and unfailingly presents a well-balanced sound. So often in other choirs the sopranos and altos are well represented with the tenors and basses thin on the ground. This is certainly not the case with this choir where the male voices are equal to the very best.